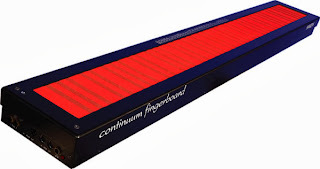 In my search I found Another professional musical device that also uses a pad surface and touch pressure sensitivity that they call the Continuum and can be seen and purchased here: http://www.hakenaudio.com/Continuum/. It uses some other method to sense touch with magnetic sensors. They have some amazing samples of some of the sounds that it creates that sound fantastic. But again its a bit pricey for me with the smaller unit priced at about $3300usd and the larger unit is up to $5200usd. Also another thing to note about this device is the surface material they use on the pad being neoprene, the same material used in wetsuits. This gives it a feel of some feedback as to how hard your pushing on it. I think this is a very good idea even if it adds cost to our device it would be nice to have at least a neoprene top pad as an option if not standard in our devices. A portion of the Music Blogs I like are One Track Mind, and The Hype Machine, so go look at them. Keep in mind your assessment is firmly empowered; this is the manner by which the locales can supply you with new music day by day. Playlist Promotion Get on more Spotify playlists.